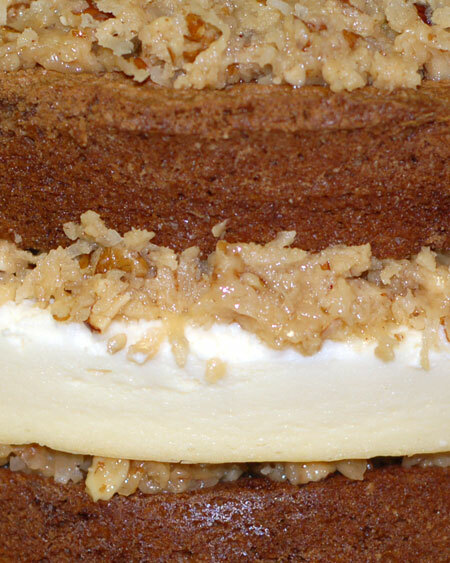 This is the German chocolate skyscraper cheesecake from the Junior’s Cheesecakes cookbook. I got the book back in November due to fond memories of Junior’s from Jeremy’s grad school days. Although almost every recipe in the book is drool-worthy, I somehow haven’t gotten around to trying one out until now. My prior experience with baking cheesecake has been limited to an old family recipe. It’s a simple one with few ingredients, and I always cooked it in a graham cracker crust until the top was quite brown, then served with cherry pie filling (just the cherry goo part for me, no actual cherries please!). I didn’t make it often, but just enough that I couldn’t really understand why the thought of making a cheesecake seems to strike fear in so many bakers’ hearts. (Perhaps, for that reason, it would be a good Daring Bakers project one day?). Maybe that’s why the thought of baking a two-layer cake with a New York-style cheesecake sandwiched in the middle didn’t make me cringe. I have to admit, though, that once it was actually underway, I started to doubt myself. I bought all the ingredients for the cake the previous weekend, but since then, one of the bricks of cream cheese was repurposed for emergency bagel-smearing needs. I anxiously watched the morning slipping away until Jeremy could run back over to the store for me, and by the time I got started on the cheesecake layer, it was already around 1:30pm. According to the book, both the cheesecake and chocolate cake layers needed several hours of cooling time on a rack, followed by time in the fridge (and freezer in the case of the cheesecake)—in other words, this recipe is the polar opposite of the all-in-the-pan cake I last wrote about. Then there is the fact that my oven is not the most reliable, and I pictured my cheesecake coming out of the oven with an uncooked and sunken center and a scorched top. I muttered to myself that, even if it did come out poorly, the flaws would be hidden in the middle of all that cake and frosting. 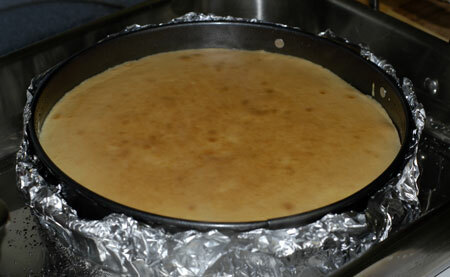 However, it was too late to back out, and a good thing too: Foil-wrapped and water-bathed, my cheesecake was done exactly when the recipe indicated it should be, perfectly set and lightly golden on top. Not only did it never crack or sink, it pulled gently from the sides of the springform as it cooled, and performed beautifully in the finished cake, as you will see. The cake batter was a little fussier, and the cooled layers threatened to crack a bit when it came time to wrap them in plastic wrap for refrigeration, but they held up just fine in the end, and the trimmings indicated the cake itself was very fluffy and light and German-chocolatey. I also toasted nuts and coconut while the oven was still hot. By this point it was past dinnertime, so I paused long enough to make a big batch of lamb kefthedes and spinach-mashed potatoes for dinner, and watch the post-Superbowl episode of House. Then it was right back to the stove to clean up and make the frosting. This is the part of the recipe I feel a little sketchy about. It took quite a bit longer than described at a hard simmer to achieve a golden-brown color, and when I started adding nuts and coconut, it stiffened up in a hurry. 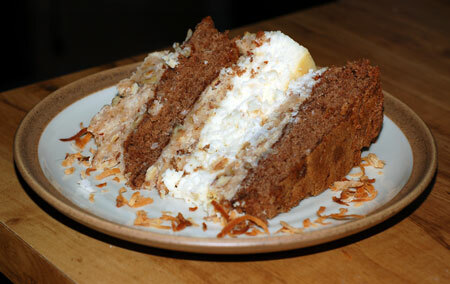 I ended up adding less coconut than called for, and after a half-hour cooling period in the fridge, it was so hard and crumbly that there was no way I could spread it on the cake; my solution was adding a bit more cream for lubrication and zapping it for a few seconds in the microwave. At least then it more resembled frosting than candy, and I was able to gently smudge and press it over the layers. The cheesecake layer was a walk in the park by comparison. I didn’t bother trying to frost the outside edges of the top cake layer as the recipe indicated, even though there was probably enough frosting leftover to do so; it would never have stayed put. 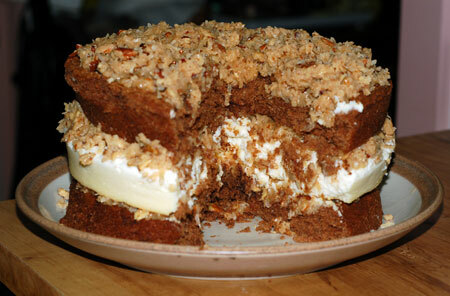 This post is my entry for the Serendipity Bake-Off being hosted by Familia Bencomo. I think it’s impressive-looking without needing additional decoration… at least that’s my story, and I’m sticking with it! Early in the day, preheat the oven to 350F and generously butter the bottom and sides of a 9-inch springform pan. Wrap the outside of the springform tightly with foil, covering the bottom and all the way up the sides. Put one package of cream cheese 1/3 C sugar and the cornstarch in the bowl of a stand mixer and beat on low until creamy, about 3 minutes, scraping several times. Blend in the remaining cream cheese, one package at a time, scraping after each. Increase the mixer speed to medium and beat in the remaining sugar, then the vanilla. Blend in the eggs one at a time, beating well after each addition. Beat in the cream just until completely blended. 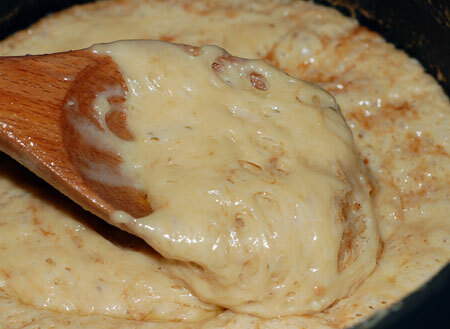 Gently spoon the batter into the prepared springform and place in a large shallow pan containing hot water that comes about 1″ up the sides of the springform. Bake at 350F for about 1 1/4 hours until the edges are light golden brown and the top is slightly golden tan, looking set and no longer wet. 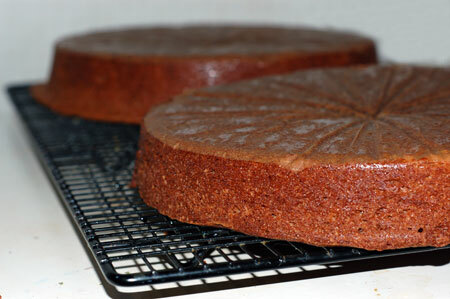 Remove the cake from the water bath, transfer to a wire rack, and cool in the pan for 2 hours. Cover with plastic wrap and refrigerate (still in the pan) until completely cold, about 4 hours. Place in the freezer, still in the pan, for at least half an hour before assembly, or overnight if you are preparing in advance. 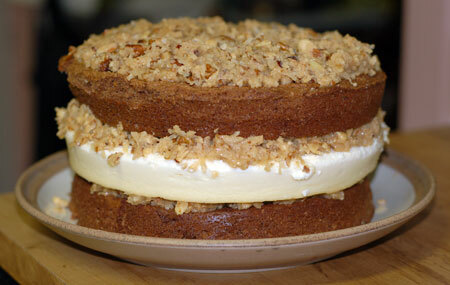 Once the cheesecake is out of the oven (make sure to remove the water bath), start the cake layers. Generously butter the sides and bottom of 2 9-inch round cake pans. Line the bottom of both pans with parchment paper, but don’t let the paper come up the sides. Sift the flour, baking powder and soda, and salt together in a small bowl. Melt the chocolate in the water in the microwave or in a small saucepan over low heat, then set aside to cool. Cream the butter and sugar together in a large bowl on medium speed until light yellow and creamy. Add the egg yolks one at a time, beating well after each. Blend in the melted chocolate and vanilla. Using a wooden spoon, stir in the flour mixture, alternating with the buttermilk and blending well after each addition. Beat the egg whites and cream of tartar together in a clean bowl on high heat until stiff peaks form. Stir about 1/3 of the whites into the chocolate batter to lighten it, then fold in the remaining whites. Don’t worry if you still see a few specks of white, since they’ll disappear during cooking. Divide the batter evenly between the two pans and bake at 350F until a toothpick inserted in the center comes out with a moist crumb, about 30 minutes. Cool the cakes in the pans on a wire rack for 15 minutes, then turn them out onto the rack and gently peel off the paper liners. Let the cakes cool completely, about 2 hours, then cover with plastic wrap and refrigerate until ready to assemble the cake. Once the cakes are out of the oven, spread out all the nuts on a large rimmed baking sheet and toast at 350F until golden, about 5 minutes, tossing once or twice. Set aside to cool. Toast 1/4 C coconut the same way until golden brown and set aside for garnish. When you are nearly ready to assemble the cake, mix the sugar and flour together in a large saucepan. (This is when I moved the cheesecake to the freezer.) Add the cream, milk, butter and vanilla, and stir until well combined. Cook and stir constantly over medium heat until the mixture thickens and turns golden brown, about 12 minutes. Remove from the heat and stir in the toasted nuts and untoasted coconut. Refrigerate until the frosting is thick enough to spread, about 30 minutes. Remove the cheesecake from the freezer and let stand at room temperature for 10 minutes (if frozen overnight). Place one cake layer, top side down, on a cake plate. Spread with frosting. Release and remove the frozen cheesecake from the ring of the springform, then release and remove from the bottom of the pan (I slid a thin knife around the bottom, then flipped the cheesecake bottom and all onto the cake layer and gently pulled the pan bottom off the now-top of the cheesecake.). Spread with some more frosting. Top with the remaining cake layer top side up, and frost the top of the cake and the sides of the top cake layer only. Sprinkle the top evenly with toasted coconut. Refrigerate the cake until ready to serve (if the cheesecake was frozen overnight, it will take about 2 hours to thaw enough to easily slice). Use a sharp straight-edge knife, not a serrated one, to cut it. Source: Junior’s Cheesecakes Cookbook, by Alan Rosen and Beth Allen, pg. 160-161. I have been seeing some recipes pop up for this book, but after this one, I am totally buying this cookbook! YUM! Deborah, this book has given me a huge confidence boost in the cheesecake department. They are by no means everyday desserts, but it’s a good feeling to know I can pull one off just as well as the restaurant if the occasion calls for it! This looks soooo heavenly! Your husband is a lucky man! Thank you for submitting this to our contest. I found this recipe in your blog this time last year when I was doing a search for none other than german chocolate cheesecake. It definitely appeared to be a daunting task, and I was nervous! Took me two whole days to get it done, but it was well worth it! I made it for my love’s birthday last year and he was in heaven! So much so that for the last couple of weeks hes been dropping hints about it! So today I am off to the store to get the ingredients I’m missing, only this time, I’m going to make it into two smaller cakes..
one for now and freeze one for later! This thing is a beast ( I swear last years weighed a good ten pounds if not more!)! Anyway, thanks so much for putting this out there! Oh, and the cheesecake recipe is the best! I’ve used this recipe multiple times over the past year with a variety of different toppings and crusts and every time it is heavenly! !